A new $100,000 endowment created by the Masonic Charities of Oklahoma will support USAO’s creative Festival of Arts and Ideas project, now in its fourth year. From left are John Logan, executive director of the Masonic Charity Foundation of Oklahoma; Dr. Michael Nealeigh, vice president for university advancement at USAO; Glenn Almy of Manford, grand master Mason; USAO President John Feaver; and MCF Board Members Richard Massad of Oklahoma City and Robert Davis of Guthrie. They dreamed it. They built it. And now the Masons are helping to fund it. When a team of faculty joined with the USAO Foundation four years ago to create a festival merging arts and ideas into an engaging format that educates while it entertains, they started something that is gaining real momentum this month through a $100,000 gift from the Masonic Charity Foundation of Oklahoma. 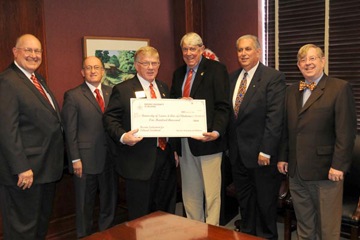 Leaders from the Masons’ philanthropic foundation in the Sooner State visited campus in May to deliver the check in person. Faculty who plan the festivals met the Masons with open arms. “I am proud, as an Oklahoman, that our state has this excellent institution dedicated to the arts and sciences, and I am thankful, as a Freemason, that our fraternity has the opportunity to support this university in its important goals,” said grand master of Masons Glenn Almy. This gift to the USAO Foundation creates the Masonic Endowment for Cultural Enrichment at USAO. The Masons' agreement with the foundation also encourages other donors to enrich the fund in support of USAO’s Festival of Arts and Ideas. The fund is permanently restricted, with all earnings used to support the ongoing arts/ideas festivals. Coming this fall, the festivals continue with an Oct. 11-13 event titled The Great Minds, which focuses team presentations on influential thinkers and doers. In March 2011, the festival focused on “Fostering Creativity,” a series of workshops and presentations designed to guide attendees in finding practical applications for developing and nurturing creativity in his or her personal and/or professional lives. In fall 2010, the festival focused on “The Creative Process,” following USAO’s successful involvement in the World Creativity Forum. It all began in fall 2007 with a series called “The Five B’s,” which was a series of interdisciplinary weeklong festivals highlighting the work of five composers and examining their immense influence. The success of the Bach, Beethoven, Brahms, Bartok and Bernstein Festivals inspired a re-invention of the festival. The festivals are two- or three-day events which take place each semester and feature music, lectures, discussions, exhibits, readings and live dramatic presentations that are inspired by, or interpretations of, a central theme. The “ideas” at the core of each festival encourage a journey of exploration over a broad cultural and physical geography. They are designed to celebrate the connections between the creative arts, literature, history, politics, science, innovations in technology and the development of ideas over time and across cultures. More information about the Festival of Arts & Ideas is available at usao.edu under the button Arts & Ideas. Interested persons can write to arts-ideas@usao.edu. More information about Masonic Charities is available from www.mcfok.org.